What is THE inspiration that fuels your journeys, Sole Sisters? Is it a favorite song or music video, a colorful postcard or unforgettable scene from a movie or perhaps a quest for the yummiest dish on the planet or maybe The Meaning of It All? Welcome to the newest series on Sole Sisters: Inspired Travel Thursdays where we feature trips that were sparked by a book, snatches from a poem, lyrics from a song or even a person! It was love that first led me to Mt. Pulag. This sounds REALLY cheesy but it’s true! During my college days at the Ateneo in the mid-90s, I was infatuated with a Pulagphile who was also a straight-A management major and minor star in our campus basketball league. During breaks between classes, he’d become animated convincing me and our other mountaineer friends that Pulag was THE Philippine mountain to climb. He raved about how awesome it looked surrounded by its “sea of clouds” at sunrise. He made scaling its heights sound like the coolest thing to do on earth! I couldn’t help but be infected by his enthusiasm over this northern Luzon peak that towered over all others except Mt. Apo in his Davao hometown way down in Mindanao. Since his heart was set on Pulag, so was mine. I simply had to climb this mountain. My fascination with Pulag, however, lasted longer than that infatuation. All other climbs were just preparation for a date with my Pulag destiny. Reaching Pulag’s summit had become my Holy Grail. I brought a magazine with my favorite Pulag feature article in it every single place I went. 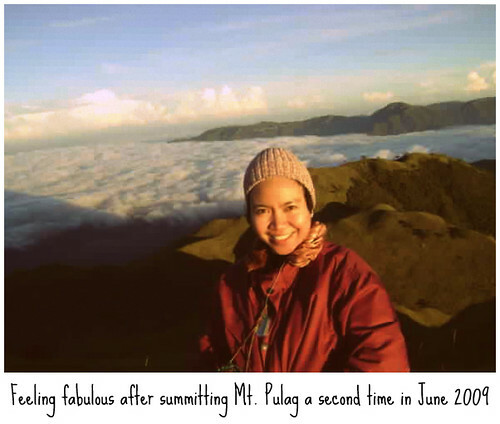 I talked about my Pulag dreams with my friends all the time until one of them finally connected with a few office-based mountaineering groups that were Pulag-bound in an online forum. Six years after college graduation, I finally stepped out of a Victory Liner bus from Manila past 3 a.m. into the frigid air of downtown Baguio City on December 28, 2006. My teeth chattered even through my heavy knitted cap, scarf and gloves plus jacket and pants. Eight degrees celsius at this takeoff point to Benguet was enough to shock my body into preparing for Pulag’s much, much lower temperatures. Our dawn jeepney ride through Ambuclao Dam and up Kabayan’s rugged trails also gave enough time for my body to acclimatize itself. No freezing temperatures and no amount of jarring from a two-hour long jeepney ride through Benguet’s cliffsides could stop my Pulag dream from coming true. Indeed, Mt. Pulag, with the sky above it a vivid cornflower blue, the crashing music of Eddet River’s life-sustaining waters on aged gray boulders and its gasp-inducing panoramic views from almost every point of the trail, was more beautiful than I could have ever imagined! Then things quickly went downhill after that first day communing with Mother Nature from the Akiki Trail jumpoff point. A fierce storm caught us on the almost vertical winding slopes of the grasslands before we could make our way to Saddle Point, our last campsite before the summit. The heavy curtain of rain made following the trail virtually impossible and its lashing winds seemed bent on throwing us off down the steep slope of the mountain. This ugly weather isolated two men from our group at a makeshift overnight camp on the side of the mountain, subjected a fellow female mountaineer to hypothermia and left the rest of us shivering while we huddled together as rainwater seeped into our tents. Every one of us miraculously survived this bout with nature’s full force. My countless Hail Marys all through that night and a half-day of interminable downpour and fervent promises never to desert my family for a bit of “social climbing” during the Christmas holidays surely helped. I also learned a few invaluable lessons: 1 Wet towels, hand sanitizers and pantyliners are ALWAYS a girl’s best friend during extended backpacking trips. 2 It’s a plus to be chummy with the guys who can brew the camp’s supply of morning coffee and cookits yummy macaroni dinner with corned beef and hotdogs. 3 And last (but most important) climb mountains only with people who will guard your life as you would theirs and whose company you genuinely enjoy. 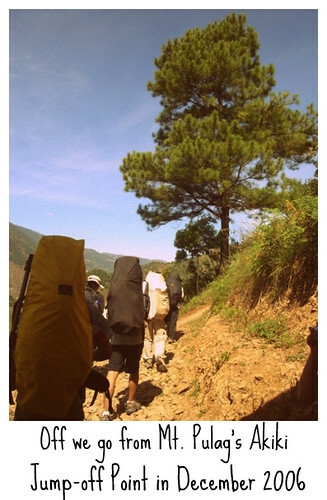 I set off to climb Pulag in the first place in the bid for a guy’s attention and love. In the end, it evolved into a journey of personal meaning and love for the woman I was becoming. I reached the summit of Pulag for the very first time and it was like no other high! I later returned to soak in Pulag’s beauty – its verdant green plains and rolling hills, pure shafts of sunlight straight from the heavens and even the guiding spirit of our ancient Igorot forebears in its whispering breezes – during Freedom Climb 2009 in celebration of Independence Day. So whoever or whatever inspires you to travel, Sole Sisters, I hope it will be inspired by Love and not just the next Cebu Pacific Seat Sale. 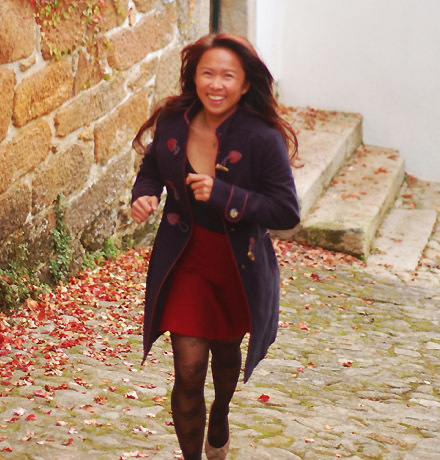 Pauline is a freelance writer from Manila, Philippines. 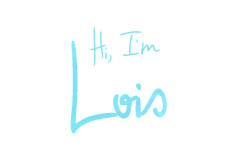 She has written for magazines like Marie Claire, COOK and InFlight. Six years after graduating from the Ateneo de Manila University in 2000 and some serial job-hopping, she finally committed to her first love- writing. Follow her on facebook or twitter and send her projects through contact.mariapaulineapilado(at)gmail.com. 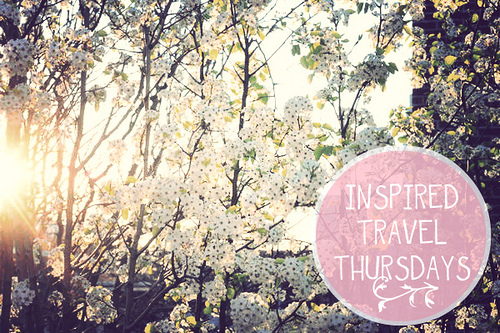 Would you like to contribute to the Inspired Travel Thursdays Series? Whatever or whoever inspires you to just go, do let us know! 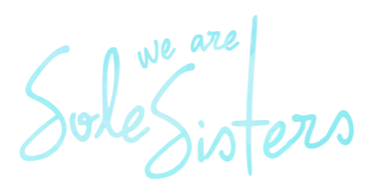 Send us an email at solesisters(dot)weare(at)gmail(dot)com. Very nice feature! Reading the article made me remember the memories of my climb last year -- the finger-numbing temperature, the burden of a carrying a heavy pack, and the jaw-dropping beauty of the sunrise. Pulag is really THE Philippine mountain to climb. Just found your blog! I love it, I want to travel with my sisters! Aba may katapat na si Garduce. Delikado. I think I have this Mt. Pulag included also in my song "Duyog Na", a song inspired by the beauty of Kalatungan Range, Bukidnon where double rainbow appearing after the rain in afternoon is simply amazing. Glad you connected with Pauline's post Jonna! Maybe you can also contribute to this series in the future. 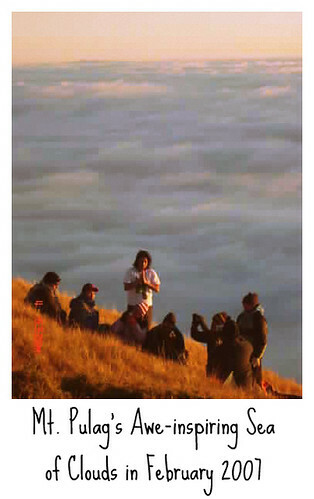 Ikaw ba yung isa sa Sea of Clouds picture Erick? Thanks for dropping by em! Hope our blog inspires you to travel! Yay! Tell us all about it. Sounds like an exciting adventure! Read your blog and I'm jealous of your Siargao posts! I saw the video of your song Ricardo. Fantastic. Thanks for sharing! Thanks for dropping by Green Pen! wow! making it via akiki trail is impressive. Great read! Reading it gave me goose bumps along with the memories of how Mt. Pulag looked and felt when I scaled with last 2010 with my friends. I can relate to Ms. Pauline's foremost reason for joining the climb - a bid of a guy's attention, but a lot of things can happen during those couple days when your strength and patience is tested. In the end it was my strong bond and relationship with my best friend that was tested. It never felt so good surviving over this mountain's challenge with friends I had since elementary days. It is a memory we'll all share in our lifetime.